The 46.3 metre motor yacht Allegria is offering a reduced rate of $200,000 per week for charters in the West Mediterranean this summer. Allegria was built in Holland at the Hakvoort Shipyard to Lloyds class with delivery in 2004 and has been constantly maintained in impeccable condition. She recently completed an extensive yard period which included replacing the generators, a new SAT system and the completion of her 10 year Lloyd's survey. Allegria offers accommodation for up to 11 guests in four luxurious cabins. The full beam master suite has a stunning master bathroom, with a large Jacuzzi and rain shower, as well as a private study area and dressing room. The other three cabins are all ensuite and feature fine marbles and cherry and maple burl woods as well as state of the art entertainment systems. Her deck spaces are equally impressive and perfect for enjoying the Mediterranean sunshine. She offers multiple spaces for al fresco dining on both her main and bridge decks while the open-air sun deck is perfect for sun lovers with a Jacuzzi, grill, sun pads, bar, chaise lounges, and a hammock. She also boasts an extensive toy box which includes underwater scooters, complete scuba diving equipment, kayas and paddle boards. While for those looking for more of a work out Allegria is equipped with a treadmill and work out equipment as well four mountain bikes. Powered by Caterpillar engines she has a cruising speed of 14 knots and top speed of 15.5 knots. 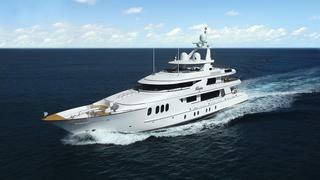 Allegria is available for charter through Moran Yacht & Ship and she is also currently listed for sale.